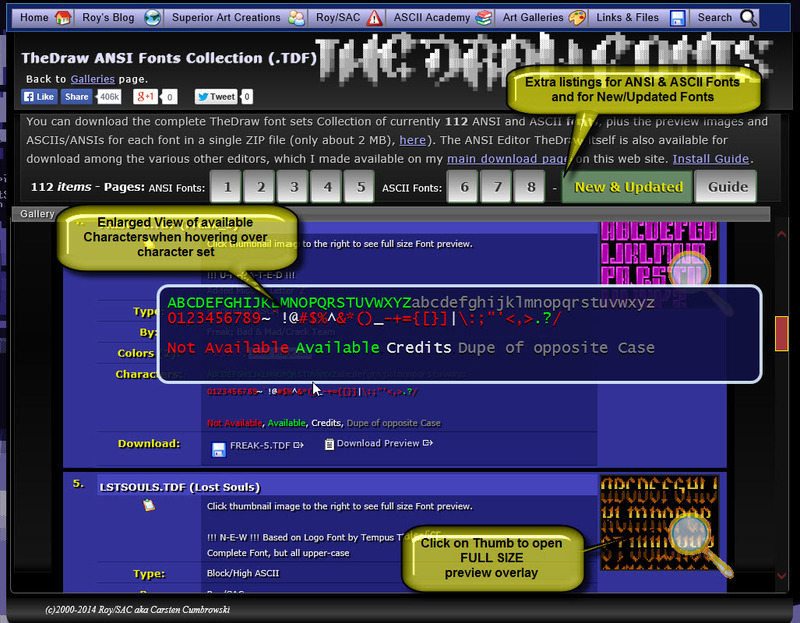 I already added the Fonts collection for the ANSI Text Editor “TheDraw” back in 2010. Back then I already thought that it would be nice to provide the information for each font, which characters each font supports and to provide a preview to get a good idea how each font looks like. When I launched the collection only a few fonts had this information available and then my site went black for about 2 years and that was that. Well with the re-launch of my site, many of my collections became under scrutiny, I remodeled the navigation and started using JQuery scripts for state of the art overlay effects and dynamic interactions. When I was looking at the Fonts collection for TheDraw, I remembered my original intention and ideas and decided to finally realize it reality. As of now, I show for every font in my collection the available characters. It’s shown in the listings and enlarged for better visibility if you hover with the mouse of a set (see screen shot). While I was at it, I also updated my already existing 2 ANSI and 2 ASCII Fonts as well as 6 fonts by other folks where I added missing characters etc. I created myself 5 entirely new ANSI (colored) fonts to expand my collection. Here are some previews of them. Also shown some of the other updated/extended fonts. Instead of just bulk and unsorted listing all fonts, I now have them categorized by ANSI (Colored) Fonts and ASCII (Text) Fonts. I also added a separate section for New Fonts and Updates for people who already downloaded stuff from the collection and would like to see what’s new and fresh. As already provided in my old version of my collection, a simple “How To Install and Use the Fonts with TheDraw” Guide us still provided for folks who might just got started with Text Art. If you are one of those guys, I also would like to suggest to you, to have a peek at my ASCII Art Academy section with its many articles and tutorials. Carsten aka Roy/SAC in 2014. Previous Post: Blog, Atom, RSS, XML and Syndication/Aggregation ! ?